Like any typical South Indian, I LOVE to deck my hair with flowers – 3 ‘mozham’ – approximately 3 feet length of stringed jasmine would be great – I could make four equal folds of it and pin it on to my hair. That would look great some 30 years ago when I had an enviable long and thick braid. Now I sport shoulder-length hair held with a clip – so I have to be careful not to look silly with strings of jasmine longer and thicker than my hair. Not that there is any chance for that – living in Pune, I manage to get jasmine flowers only for a couple of months during the summer. And I try to make the most of it then! I don’t care for the non-fragrant white ones available during the monsoons. 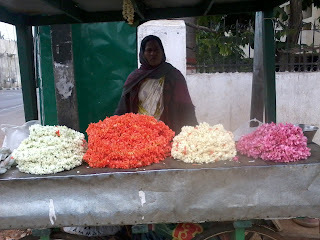 I had this ‘gajrawala’ who would land precisely during the season and regularly supply fragrant gajaras every day. It was pretty affordable at three feet-length of gajara for Rs. 5 till a decade ago. The cost soon doubled. But I didn’t give up my fad. 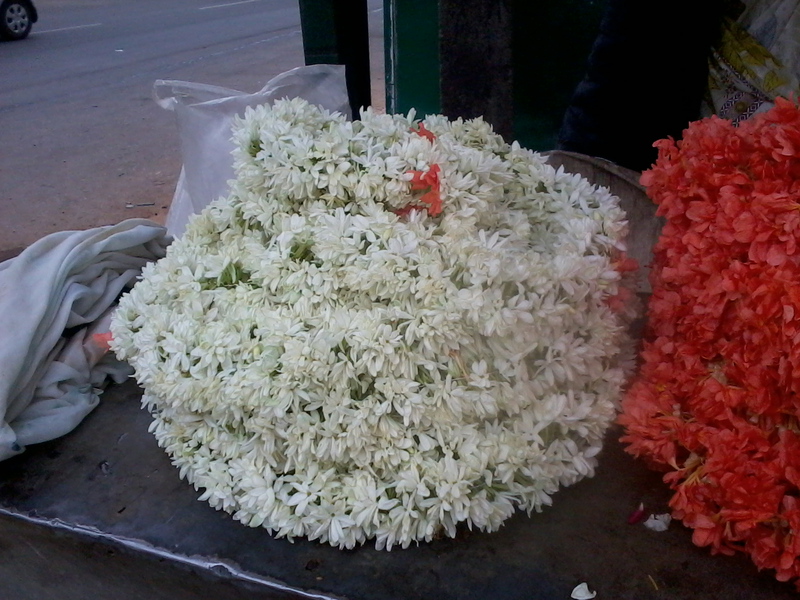 This year it doubled again and gajaras were sold at Rs. 20 for the same length! I had to restrain myself to an extent! One day the florist didn’t have gajaras – she had just opened shop and she just had fresh jasmine flowers – unstrung. I decided to go for it – bought loose flowers for Rs. 10. She wrapped the flowers in a piece of newspaper and wound a long string around it and handed it over to me. I came home bubbling with enthu. Yes – I was going to string the fresh jasmine flowers myself – how long since I had done so! I unwound the thick thread and kept it aside carefully. I transferred the jasmine flowers on to a plate and sprinkled water on them. I wetted the string and started stringing the jasmine ….as my mind weaved nostalgic memories of the bygone years ………. My father was on a transferable job – Bangalore and Pondy and Madras satisfied our craving for flowers – yes my mom and sis too shared the same love! But other postings were not so benign! My dad was posted to Port Blair way back in 1965 and I was packed off to Kerala to my grandparents’ and aunt’s to pursue my studies - ninth standard! Yes there was no High School in Port Blair then! Hm…Kerala – I went crazy with the dizzy fragrance of ‘malli’ / ‘mulla’ poo. There was this neighbor who would send – yes – three feet-length of jasmine flowers every day. I’d use half of it that evening and wrap up the remaining in a wet cloth (no fridge those days) for the next day – for school. Most girls too would wear flowers, so you can well imagine the pervading fragrance in the classroom! Sometimes there would be ‘maru’ (the ‘hm…so-fragrant’ tiny leaves) too strung along with jasmine and ‘kanakaambaram’ and I had this special tri-colour sari to go with it. Very rarely we’d get violet ‘December’ flowers – so you can guess what color sari I’d wear with it. Ah yes – it was – ‘saris only’ in the early 70s for collegians in the South – not even salwar-kameez! I have never strung flowers for a decade and a half! 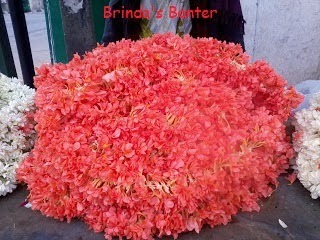 I felt good as I finished stringing them and took a look at the thick ‘gajara’. Even more so as I sported it and went for my walk – I could make out that my fragrant and extra-thick gajara made many heads turn. My friends took the liberty of scrutinizing and complimenting it. 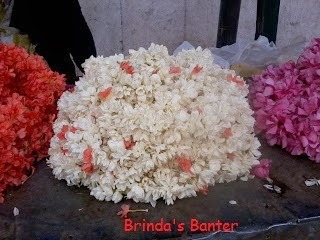 I made it a routine – buying loose jasmine flowers and making ‘gajras’ at home. It has just struck me that this art which every South Indian girl of my generation is adept at, will soon be lost forever. My daughters-in-law don’t get a chance to sport ‘gajras’ – being in the US. I thought I should impart this skill to my six-year-old granddaughter – just for the heck of it! She is game for any craft – last time we visited her, we went crazy looking for craft boxes for her and finally got her a ‘bracelet-making kit’. I know what craft can be imparted to her the next time we meet - I’ll teach her and my youngest granddaughter too - to string flowers! YES! !